Winner volleyball team, ranked No. 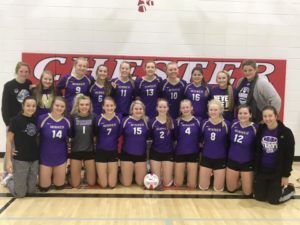 3rd in Class A, defeated Gregory in three sets on Oct. 2. The scores were 25-10, 25-9, 25-7. Ellie Brozik and Mackenzie Levi were 100 percent in serving. Brozik and Morgan Hammerbeck each had 4 ace serves. Hammerbeck had 9 kills, Kalla Bertram, 6 and Brozik, 5. Maggie LaCompte had 17 digs and Brozik, 8. Hammerbeck had 1 solo block and 1 block assist. Abby Marts had 1 block assist. As a team, Winner was 98 percent in serving with 9 ace serves, 29 kills, 27 set assists and 46 digs. “We came out focused and ready to play,” said coach Jaime Keiser. “We were aggressive and did a great job of attacking and serving the ball which kept Gregory on the defensive end. We played three consistent games. The girls played as a team and were having fun,” said Keiser. The Lady Warriors improve to 16-1 with the victory. The Winner Lady Warriors volleyball team defeated Arlington in 4 sets at the Chester Challenge on Saturday. The scores were 25-14, 22-25, 25-16, 25-19. Morgan Hammerbeck was named the MVP of the match. Hammerbeck and Maggie LaCompte were 100 percent in serving. Ellie Brozik had 4 aces and LaCompte, 3. 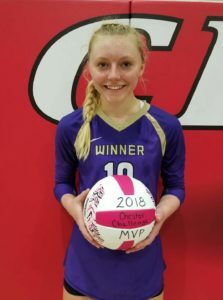 Abby Marts had 23 kills and Hammerbeck, 13. Mackenzie Levi had 27 set assists and Addy Root, 22. Hammerbeck had a 2.20 serve receive rating and LaCompte had a 2.06 serve receive rating. Hammerbeck had 27 digs and LaCompte, 25. As a team, Winner was 95 percent in serving with 8 aces, 59 kills, 56 assists and 122 digs. “Arlington is a very experienced, scrappy and well coach team,” said coach Jaime Keiser. “We came out ready to play and had the momentum most of the first set. The second set we gave Arlington too many unearned points. We switched our defense in the third set and it helped get to Arlington’s tips, down balls and attacks. “Arlington was very scrappy and would get to every ball we hit to them. We did a great job of attacking the ball over and over wearing them down. I was very proud of the girls and their effort. They played with a lot of heart and intensity. It as a total team effort,” said Keiser. The Lady Warriors defeated White River in three sets on Thursday. Winner won 25-17, 25-10 and 25-12. Ellie Brozik was 94 percent in serving and Littau was 90 percent. Brozik had 4 aces and Littau 2. Hammerbeck had 14 kills and Abby Marts 9. Levi had 18 set assists and Root, 9. LaCompte had 10 digs and Brozik and Hammerbeck with 8 each. Kalla Bertram had 1 solo block and 3 block assists and Brozik had 2 block assists. As a team, Winner was 87 percent in serving with 8 aces, 36 kills, 34 set assist, 44 digs and 4 blocks. “The first set we made too many serving and attacking errors. Then we settled down and did a great job of attacking the ball, which kept White River out of system and chasing the ball all over the place,” said Keiser. The next action for Winner will be Oct. 15 hosting Mt. Vernon/Plankinton and Oct. 16 hosting Wagner.